So sadly, summer is coming to an end. I know, I didn’t need to remind you and for that I’m sorry. Before I start with all my fall cooking and baking, I figured I’d say adieu to the summer with my favourite summer drink (the one that doesn’t involve copious amounts of liquor). In fact, this is a virgin version of one my fav drinks, the Mojito. It’s an amazingly refreshing Mojito-style drink that’s perfect for a summer lunch when you don’t wanna get all boozy. I call it the Monito (‘cuz, well, Monica + Mojito…) But you can call it whatever you’d like. 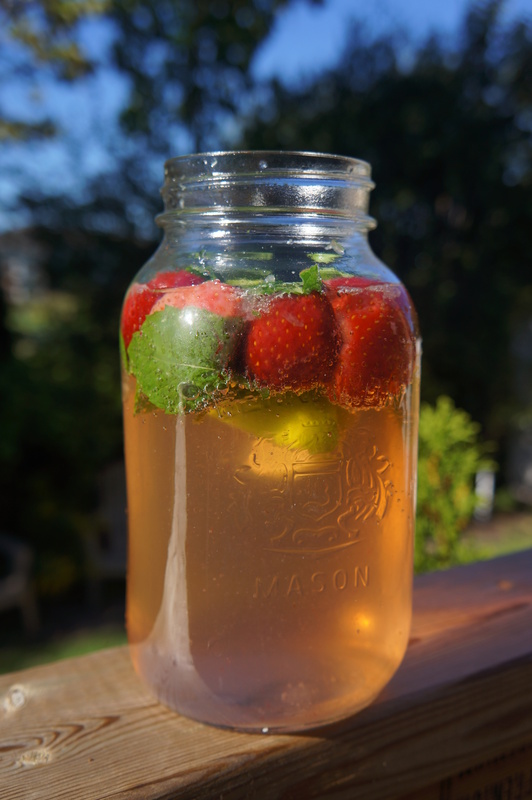 In the photo, I’ve served it in a mason jar, but the recipe below is for a full-sized pitcher. First, muddle the mint with the lime and sugar (If you don’t have a mortar and pestle, you can do this in your pitcher with the end of a wooden spoon). Throw the muddled mix into the pitcher, and pour the soda into the pitcher, filling to the top. Add the frozen fruit to chill the drink without watering it down, plus adding more fruit flavour. And please, be my guest to add some rum for a more adult-friendly partay.